Hello everyone, I’m back with another skincare post today because I’ve had quite troubled skin lately and I want to share what I’ve been using to help clear up my skin. Its been getting dark so early now, that I find it hard to get good lighting for my photos, which is very annoying because I would have liked to put in some more photos of these products, but never mind! 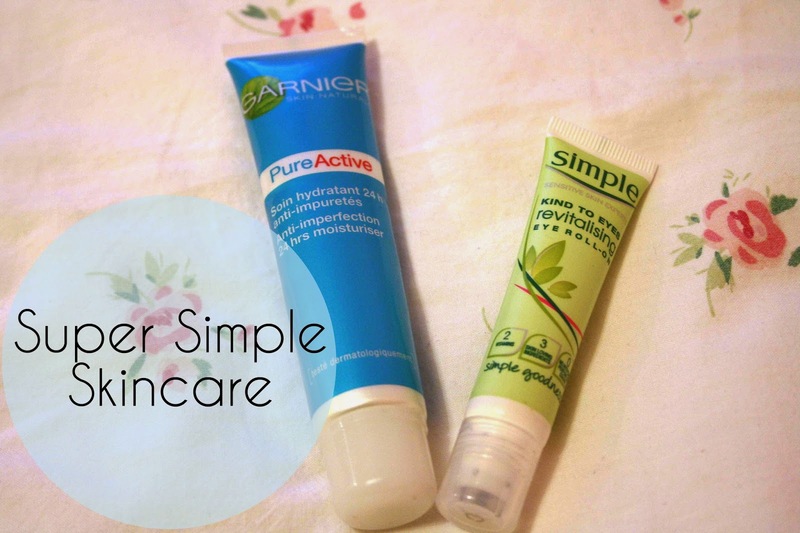 The first product on the left in the small blue tube is Garnier Pure Active Moisturiser. Its super cheap and it works amazingly. It claims to help spots, and keep skin moisturised for 24 hours. I think this has helped my spots and ‘imperfections’ slightly, however it just works really well as a moisturiser more than anything. The other incredible thing about this moisturiser is that I’ve had this for a good 4 months now, and it still hasn’t run out! I use it everyday, and it still doesn’t seem to be running out any time soon, its amazing, it just keeps on going. It doesn’t really have a particular scent, other than maybe cucumber, but it just smells fresh and natural which I really love. So if you’re looking for a cheap and really effective moisturiser, I would definitely recommend going for this one. Second product is Simple Kind To Eye Revitalising Eye Roll-On. I love this because it is just simple. I have actually noticed a difference using this under my eyes, because usually I have quite dark circles under my eyes and this seems to just take them away a bit. It definitely makes you look less tired thats for sure, which is something that a lot of people want. You just roll this on under you eyes and then gently rub in what you’ve rolled on, easy! There are so many brands that have products similar to this, however I just liked the look of simple’s one. I’d 100% recommend this product too, as I’ve had this for a while and its hardly run out! Whats your favourite skincare products? Thanks for reading guys, I really hope you enjoyed!